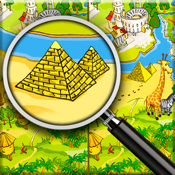 Finding The Difference is a highly addictive matching game where you will need to hunt down differences before time runs out! Each stage has fun and unique images, and at first glance the images might seem identical, but there are five differences that you will need to spot. With every correct match your time will be increased and with every incorrect match time will decrease. The interface is very easy to use. Images are able to slide around allowing larger images for each stage. Also, sliding around one image controls the other image which makes searching for differences easier. There are three levels of difficulty: Easy, Moderate, and Hard. If you get too frustrated and cannot find the differences you have the option to buy all the answers.